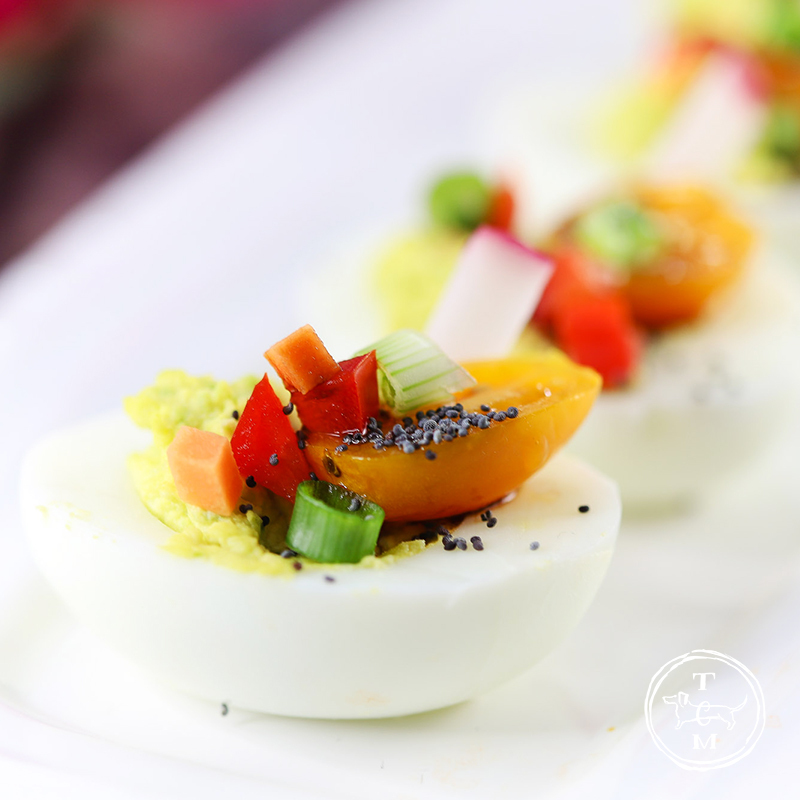 When I was a kid…I always thought that Deviled Eggs were kind of an older persons snack : ) …really I did! So I missed out on years of deliciousness…I finally tasted my Moms and found out that I was really missing something. It’s funny…because when my daughter was away at Governor’s School in Junior Year of High School…she asked when we came down to visit to bring dozens of Deviled Eggs! ??? WHAT??? I had asked what kind of treats would you and your friend love and that was the number 1 request (still scratching my head on that one!) I probably would have gone for Brownies but I brought them any way! 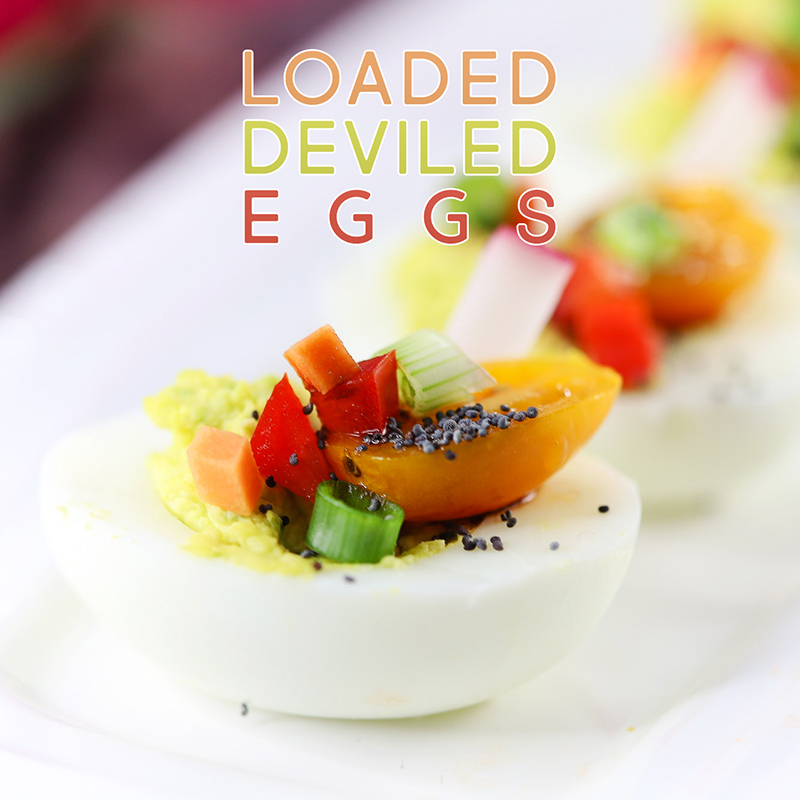 I was thinking back on the Deviled Egg delivery… so I thought maybe I should kick it up a notch with some Loaded Deviled Eggs! Then I thought…wouldn’t it be cool to make them pretty …tasty and pretty low in calories! 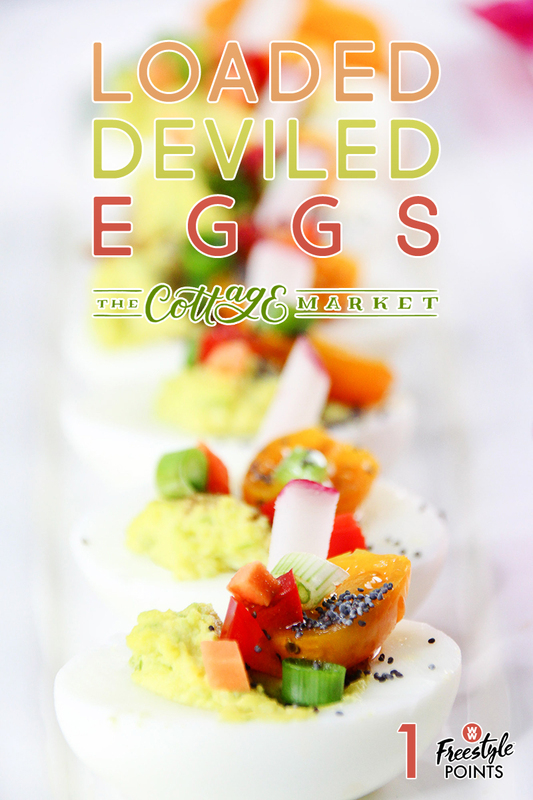 In fact 1 Deviled Egg Half will only cost you 1 Weight Watchers Free Style Point…how awesome is that. So it is time to whip up some of these Free Range Eggs! They are truly a perfect snack… appetizer… or just because food and healthy. don’t forget the Chia Seeds…Red Peppers…Sweet Potatoes and Scallion! (you can add whatever else you would love on it…the more the merrier!) Really hope you enjoy! Prep tomatoes, raw sweet potatoes, red sweet bell pepper, jalapeños, green onion, and radishes ahead of time. Boil six (6) eggs for 10 to 15 minutes and cool them down until they are safe to handle safely. Using a very sharp knife cut the eggs in half and remove the egg yolks. Place the egg yolks into a bowl, adding mayonnaise, onions, avocado, sea salt, Old Bay seasoning, and freshly cracked black peppercorns. Mix well, spoon a tablespoon of the deviled eggs mixture into the egg whites. Top with colorful veggies, then drizzle with a good grade of extra virgin olive oil, Basalmic vinegar, and poppy seeds. « Farmhouse Thrift Store Makeovers That Will Inspire! Oh yummy, love eggs with veggie goodies. When I was a kid wasn’t much for veggies but when Mr.Furry and I got married he introduced me to different ones. Didn’t love them all but more than before. These look so good. Know Mr.Furry will love them. 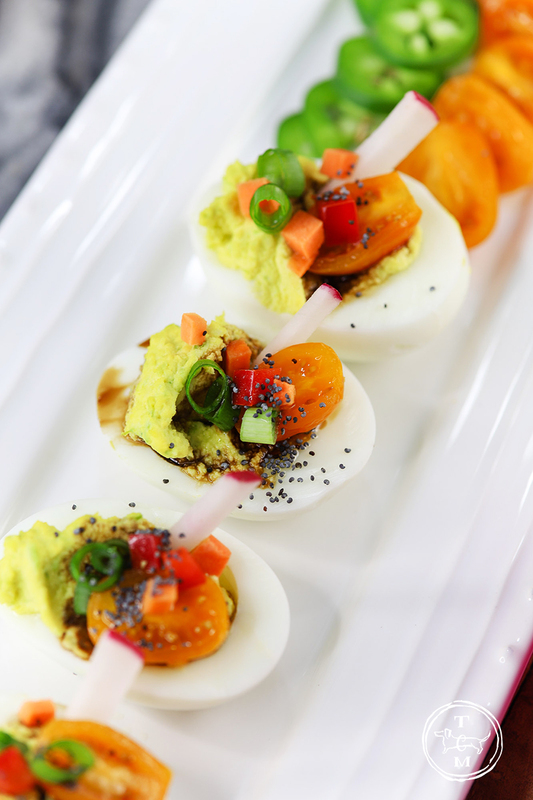 He makes up some delicious deviled eggs now and then just for heck of it. He is resident cook, likes cooking better than I do. I like to bake much more. Used to do cooking but he took over after all the kids left. I cook lots of one pot meals, more my specialty. We tend to fight when I cook as he tries to take over so I learned to walk away. Do you like to cook? Sounds like it, do you bake. I have to watch it when I bake as I love to eat baked goods way too much,have one heck of a sweet tooth. Have wonderful week and thanks for free printables. 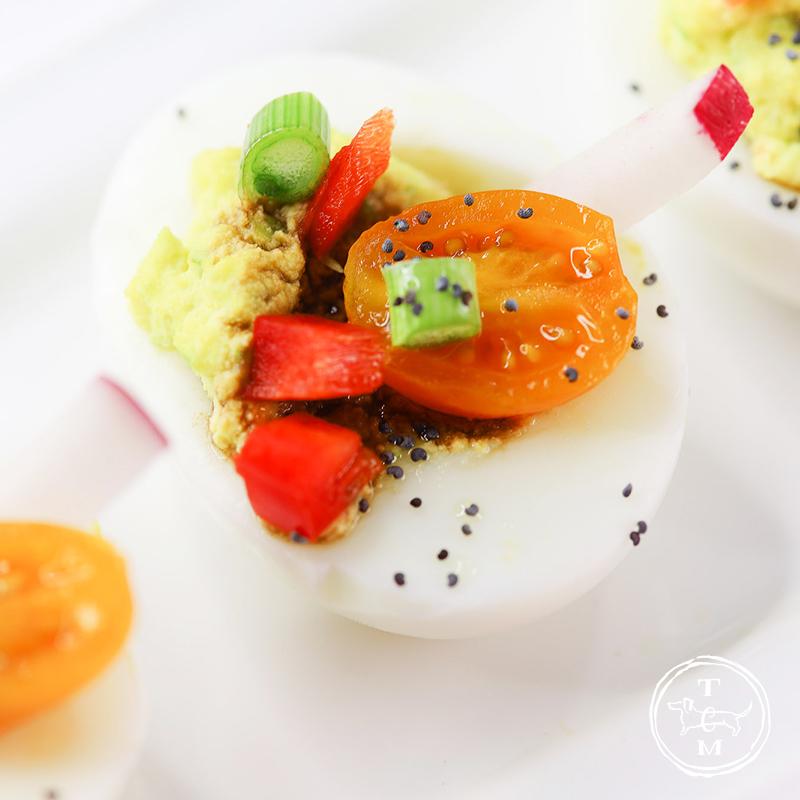 These deviled eggs are very pretty. Every once you have to change up something simple. When I make an egg salad sandwich, I change it up by adding other ingredients and flavors.